Carey Lohrenz at Belmont University in Nashville, Tennessee, October 24, 2018. Carey Lohrenz knows what it feels like to travel from zero to 200 miles per hour in under two seconds, feeling eight times the force of gravity in the process, and she understands better than most what it means to work in a fast moving, dynamic environment where inconsistent execution can generate catastrophic results. 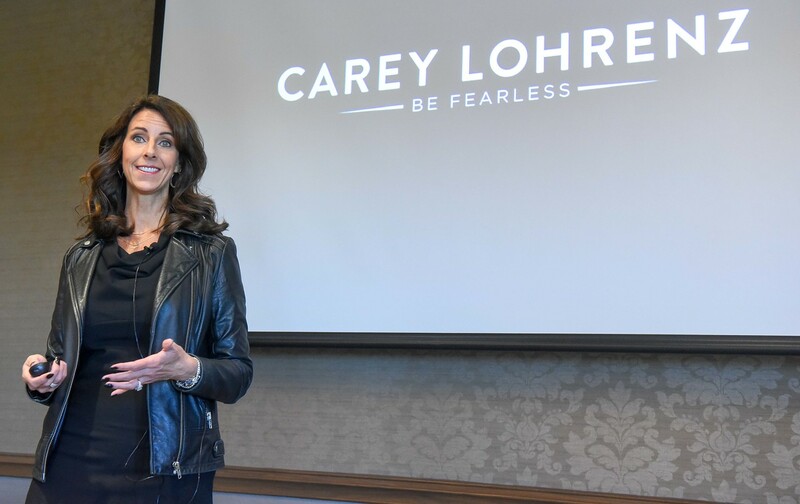 As the first female U.S. Navy F-14 fighter pilot and now a Wall Street Journal best-selling author, Lohrenz spoke on campus Wednesday to students and local business executives, offering her insight and guidance on thriving under pressure and overcoming obstacles. In events sponsored by Belmont’s Edward C. Kennedy Center for Business Ethics, Lohrenz recalled growing up in Green Bay, Wisconsin and pursuing a degree in psychology and social work. After graduation, though, she decided to pursue a different field and enrolled in the U.S. Navy’s officer training program. Her goal? To become a fighter pilot, despite the fact that no woman had ever achieved that position in the U.S. Navy. But the training had specific purpose, she said, as those who succeeded were ones capable of making good decisions that were in the best interest of the team, despite the often harrowing circumstances. In fact, it’s not always making the right decision that counts, but teams that are willing to overcome fear and act during difficult situations will contribute to success. She believes teams that are static and fearful are more at risk. Every aircraft carrier requires about 5,000 people to operate with an average age of approximately 19 and a significant annual turnover rate. Each individual must perform at the highest level to achieve success on what she noted was “the world’s most dangerous industrial work site.” Fighter pilots are listening to three radios operating at different frequencies and facing 350 switches on the plane’s dashboard, yet they must keep their eyes up, constantly roving the sky. You have to be a lifelong learner. Find an organization that aligns with your values. Stay curious and be prepared to work hard. It’s okay to be broke. Have roommates! There is no end game. Always be looking for something more. How do you bring your best self to the table?